You are probably well aware of my kids love of princesses, but they also love Disney Fairies, especially Tinker Bell. Here they are meeting her at Disneyland last winter. 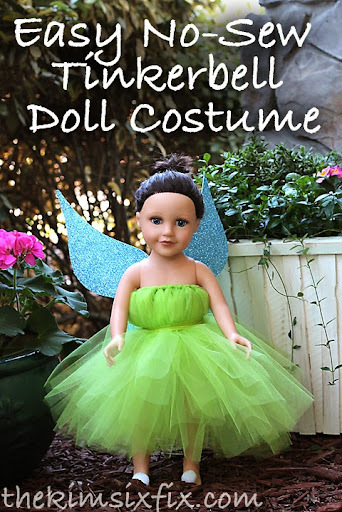 Until then, we decided we would instead make a Tinker Bell costume for their dolls. I didn’t want to do anything too complicated (I’m still recovering from the Elsa costume) so I went with a super easy, no-sew, tutu dress. It is a tutu which is tied at the chest and belted to form a dress. Simple no? I also used a scissors and my cutting machine, but it wasn’t really necessary. Next you need to know the circumference of your dolls waist. I wrapped a ribbon about the dolls chest and left about 8 extra inches on each end (so you can tie it) Then I made two knots were the doll’s skirt will actually start and end. You will only want tulle between those two knots (they also help keep the wrapped tulle in place). Now slide that loop down to one end and repeat the process, continuing down the ribbon. You can see how the puffiness of the tulle above the waist mimics a full bust line. The cool thing about this tutorial is that you can scale it up to be CHILD SIZED. A super easy way to make a halloween costume. You need a lot more tulle and the strips will be longer but the methodology is exactly the same. You could easily add commercially available wings and have a great costume for under $20! Gotta love that! Now we just have to wait a few more days to get our hands on the new Pirate Fairy movie! Until then, we can check out some other great ideas on Disney's The Pirate Fairy Pinterest board.. and probably squeeze in another half dozen or so viewings of Frozen. Linking up to MyRepurposedLife and a few of THESE parties. Thank you! This looks easy enough for me and the bitty girl to do together. So cute!!! I loved Tink as a girl- still do! Super cute! This would make a great craft idea for a fairy garden birthday party! Thanks for sharing! So smart and so cute!